Boat Description Here are the boats that serious fishermen have been waiting for. 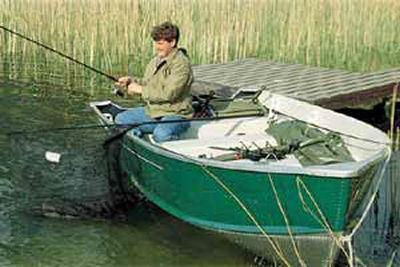 No more backbreaking lifting: These boats weigh less than a third of the weight of similar size rotationally moulded boats. This means that they are easier to pull out of the water, easier to load on a trailer and easy to flip upside down for storage. They are so light that it only takes 1 person to load the boat on the roof of a car.Long lasting : Welded seams are your guarantee of water-tightness and Quicksilvers marine quality aluminium is not subject to ultraviolet degradation. Safe and secure : Like all Quicksilver aluminium boats, these craft are unsinkable with 3 foam-filled flotation seats. Of course they are CE approved. Economical to operate : Thanks to their light weight and flat bottom they will plane with only minimum horsepower. And a light weight boat is less expensive to tow behind your car. Easy to customize : The all aluminium construction means that its easy to attach fishing rod holders, anchoring systems, accessory clips, etc. with simple pop-rivets or nuts and bolts.